OK, so they're not strangers. Most of you know how much I dislike insects. Sure, I realize that most of them have a purpose in life--flies and their larvae help break down dead tissue, ticks make guinea food, spiders *supposedly* eat other bugs (I must have slacker spiders! ), crickets exist to tell you what temperature it is and get on your nerves in the house . . .you get the idea. Still, there is actually one bug that I actively LOVE. Put yourself in my shoes (or flipflops like I'm wearing tonight). I'm walking back up to the house in the twilight after finishing my evening chore round. I'm hoping I didn't pick up any ticks along the way, and blessing the wind that seems to be blowing the mosquitoes the other direction and away from my sweaty self. The sun has set, the world is going dim. I can hear my horses munching their hay contentedly, I hear chickens softly cluck as they settle in to roost. I take a deep contented breath. And I'm surrounded by little winking dots of light. Down here under the trees, the fireflies seem determined to show me just how many of them there are. My rational brain is thinking "well yeah, it's been a wetter year than last year." Thankfully, my artistic brain is thinking "aaaaaah." I stand still. Some still choose to stay in the trees and undergrowth, but some choose to investigate this newcomer. They fly close. I don't duck or swat. I simply stand and breathe. Those little bright green lights come closer. It seems like magic, here in the twilight. For just a few moments, I feel like I live among the stars. Reality descends, and reluctantly, I head back for the house. I wonder what they thought then, those bright green stars that surrounded me. Some of them have followed me though. Would I catch them? Put them in a jar? Never. You can't bottle stars. The bravest ones that venture up to the house give me a deep feeling of contentment and rightness. Reassurance too. Looking out the window or sitting in the screen porch and seeing those lightning bugs . . .sometimes it's quite a few, sometimes it's just one. It seems like they have a message for me. I wonder what it is. I'm usually pretty good at languages, but I haven't yet learned to speak lightning bug. Maybe it's the message that you should treasure every last little moment of beauty that you can. Realize that sometimes what you think is mundane is vastly more unique and awesome than you expected. Keep that with you always--even during the worst winter storm, you'll still have the promise of fireflies later. 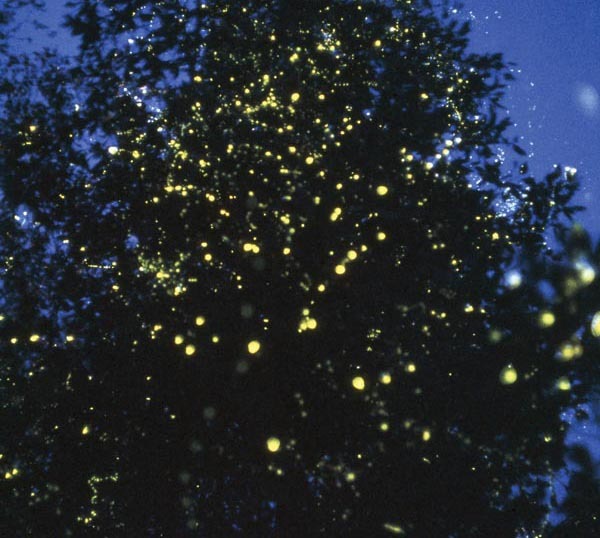 I love fireflies! Have you read Sam and the Firefly to your kids? It was one of my favorites as a child.